Create your own paper die cut craft with our cutter/cutting files. 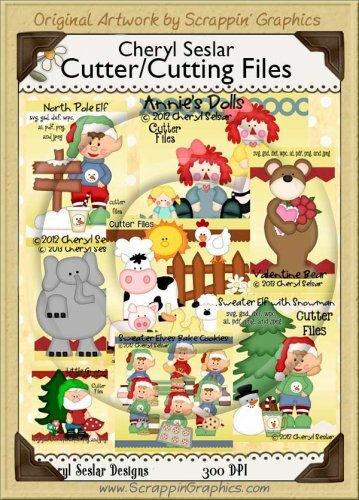 Perfect for all your paper craft projects, this collection contains 10 seperate cutting projects: Raggedy Anne dolls, Little Gnomes, North Pole Elf, On The Farm, Santa & Friends, Snowman, Sweater Elf with Snowman, Sweater Elf Bake Cookies, Valentine Bear, Valentine Elephant. Use these in scrapbook pages, card making, paper crafts and much more. Can be used for commercial use but the files cannot be resold.